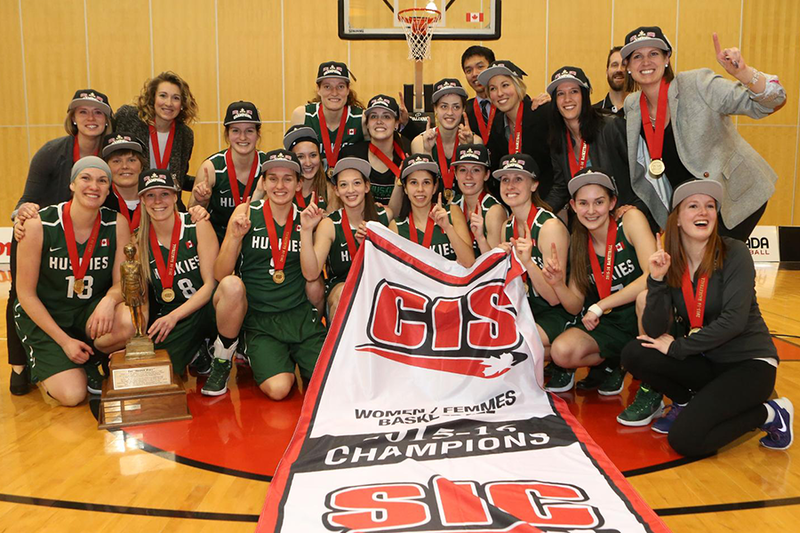 The U of S Huskies women's basketball team defeated the Ryerson University Rams to win their first ever CIS championship. For the first time in their history, the University of Saskatchewan Huskies are CIS (Canadian Interuniversity Sport) Women's Basketball Champions. The Huskies knocked off the Ryerson University Rams 85-71 Sunday afternoon at the Richard J. Currie Center to lift the CIS Championship trophy, the Bronze Baby, for the first time. "I can't be happier for this group of women," said head coach Lisa Thomaidis. "The amount of time they dedicated to this program, I can't thank them enough." Laura Dally, the Canada West MVP and First Team All-Canadian, came up with a big game when the Huskies needed it most. The fifth-year guard scored 25 points and was named the player of the game. Dally hit four of her first five three-point attempts and added six rebounds. "It feels awesome, it feels amazing," said Dally as the team celebrated on the court. "I couldn't be happier to bring it back to Saskatoon, to the community there that supports us so much." See more on the Huskies website. Huskie Athletics invites fans to our Championship Celebration this Wednesday, March 23 at 11:45 am at the Physical Activity Complex to congratulate our national champion women's basketball team. Speakers include Coach Lisa Thomaidis, President Peter Stoicheff and Mayor Don Atchison.